In the lead-up to Chappie’s release, it was clear Neill Blomkamp’s third feature was going to be a pivotal moment in his career. The film’s reception would ultimately determine whether he remained one of today’s most exciting directors or just another one-trick pony. Could he be helmed as the next Steven Spielberg or ousted as the next M. Night Shyamalan? Blomkamp’s debut District 9 came from nowhere, breathing new life into the near-dead and frequently retreaded sci-fi genre. Even on a very limited budget, he showcased an exciting style of film-making along with a fresh concept and stunning visual effects. His follow-up Elysium had everything behind it – a huge blockbuster budget, a big Hollywood action star and a vast legion of eager fans. However the idea, while original, was rushed and incompleted. The director himself has admitted that, “I just didn’t make a good enough film”. As with District 9, Chappie is set in a near-future Johannesburg, at a time when crime is patrolled by a mechanical police force. Behind the scenes, two engineers are competing to unveil their latest breakthroughs – Hugh Jackman plays a disgruntled ex-soldier who believes real people should pilot the machines, while Dev Patel’s golden boy genius wants to create machines that can actually think and learn on their own – eventually giving life to Chappie, the world’s first robot with a consciousness. Enter a gang of wannabe crims, who inadvertently steal Chappie and then use him for their own gain, which is when the fun really begins. If the plot sounds a little scattered, it is, but not necessarily in a bad way. Gaining perspective of those living a life of crime and those trying to prevent crime is actually one the film’s most admirable traits. The fact those criminals are played with perfection by members of South African rap-rave band Die Antwoord is even more impressive. Ninja and Yo-Landi, who play characters of the same name, are actually more fun to watch than Patel and Jackman (who spouts some of the worst one-liners since Australia). 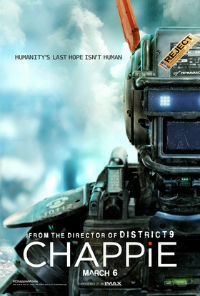 Chappie will win fans over for a number of reasons, the main being the title character. Voiced with charm and perfect timing by Sharlto Copley, the charismatic robot has as much swagger as he does heart. Needless to say, the visual effects are incredible. Chappie’s exterior design is a CGI blend of Optimus Prime and No. 5 from Short Circuit, with a number of other influences thrown in (the fact his software is called Genesis is a blatant nod). What’s probably most fascinating is the range of facial expressions they are able to capture using only his eyes and two metal rods – one for the eyebrow and one for the mouth. Unfortunately, as with Elysium, the film is let down by its ending. The reason District 9’s twist worked was because it was subtle. Chappie suddenly goes in a completely new direction only minutes before it ends, and what that all means for the characters involved is anyone’s guess. On a broad scale, where District 9 ranks ten and Elysium at one, Chappie unfortunately lands smack-bang in the middle. It shows potential but fails to satisfy as a whole. The worst part is the question of Blomkamp’s ability as director is still heavily up for debate.